In a relaxing setting of greenery and forest of 7ha, the authentic house of old stones was built in the 17th century and renovated with great care. It offers an unforgettable view above the 'Vis' valley. Within 3 minutes by car, you can have a swim in the 'Vis' river and enjoy its magnificent waterfall - a protected site - or go canoeing on the river 'Hérault'. The site is beautiful. It is a pleasure to walk along the little roads which still have the charm of yesteryear. There are many places to visit, amongst which the amazing 'Cirque of Navacelles', the meteorological observatory of the 1537 meters high 'Mount Aigoual' or the 'Caves of the Demoiselles'. You will enjoy the traditional market which is held every Friday in the beautiful city of 'Ganges' 5 kilometers away. And for the hiking or bicycle lovers there are exciting places. Our roots from the Cevennes and our love to the region did motivate us during the years of the renovation of the cottage, which was built in the 17th century during the time of the breeding ot the silkworms. It is a nice way for thanking our elders for the history and their hard work. It's the place where our sons did grow up in total freedom. The cottage is and will stay our family cottage. The hamlet of La Combe is located 2 km above the village of Saint Laurent Le Minier in front of the dale of the Vis. Everything is full of sun and green. The wide open space and the magic of this space are perfect for breathing new life. 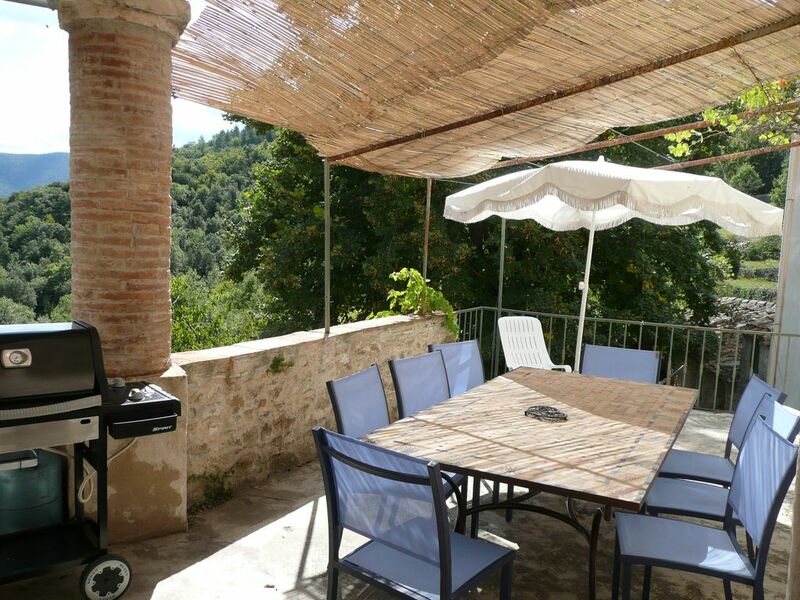 The situation of the hamlet allows you to travel through the region and than to enjoy some peace on the sundeck. The fully renovated cottage is very comfortable. During the summer, you may enjoy bathing in the clear water of the Vis and canoeing on the river 'Hérault'. There are plenty of visits to do in the surroundings, you may travel with your car, your bike, your feet or on the back of a donkey. You may also laze in the coolness of the house or in the shadow of the trees. The spacious bathroom (with showers - no bathtub) has been recently fully renovated. Separate WC. The very spacious kitchen directly accesses to the sundeck which is equipped with a big table, chairs and a hammock . A large barbecue brings additional comfort. We spent three weeks in this ancient, well equiped holiday home. It is ideal for hot days as cool inside and with a wonderful terrace to enjoy the stunning view and to watch the stars at night. On rainy or colder days the woodburner creates a romantic atmosphere. We did a lot of cooking in the well equiped kitchen. The weekly market in Ganges offers a wide variety of fresh and regional products. Try the sweet onions which are typical for the Cevennes. One very nice walk passes right along the house. Maps are also available as well as information about walks and places of interest to visit. September and October are the right time for travelling if you want to enjoy nature by watching the wildlife around the house and in the area. As the main holiday season is over the hamlet is a quiet place then. The bridge of Millau, the Mont Aigual and the vulture visitor center are quite close, and can even be combined in a daytrip. Also Montpellier is reachable within an hours drive. The communication and contact with the owners have been very easy. We got any support needed and a lot of interesting and helpful information. Un gîte très unique et genereux dans un lieu qui transporte tranquilité et la liberté de l'âme. On y trouve tous qu' il faut et même beaucoup plus. Les locateurs sont très sympa. Grand merci à Joelle et Patrick pour mettre à disposition ce lieu pour des visiteurs. Mooie locatie, groot huis ver van de bewoonde wereld . Traumhafte, ruhige Lage, gute Ausstattung, tolle Wandermöglichkeiten direkt vom Haus aus. Besonders das Baden in der Vis war für unsere Kinder ein Riesen-Erlebnis. Der Weg vom Haus aus dorthin ist jedoch relativ lang und steil, sodass wir den Aufenthalt am Fluss immer in unsere Planung evl. nach dem Einkaufen in Ganges oder dem Wandern andernorts eingebunden haben um unnötige Fahrtwege zu vermeiden. Wir haben in La Combe 2 tolle und erholsame Wochen verbracht und würden die Wohnung für Naturliebhaber jederzeit weiterempfehlen. Wir fanden besonders Terrasse und Ausblick dieser Ferienwohnung überwältigend. Nicht „Chi“ oder Schnick-Schnack sind das Markenzeichen dieser Unterkunft sondern vor allem Authentizität und Weite. Die Ausstattung der Küche ist super. Als Radfahrer muss man sich für das Ende der Tagesetappe und den letzten Anstieg zur Wohnung (180 Hm auf 1,5 km) immer noch ein Körnchen aufheben. Schräg über der eigenen Terrasse liegt die Terasse der zweiten Ferienwohnung. Obwohl diese voll belegt war, haben wir uns bei rücksichtsvollem Verhalten der anderen Gäste nicht gestört gefühlt. Eine sehr schöne Ferienwohnung mit tollem Preis-Leistungsverhältnis! Sehr schöne Ferienwohnung mit wirklich allem, was man braucht. Wer Ruhe und Erholung sucht ist hier richtig! Das Haus liegt auf dem Berg so dass man einen fantastischen Blick über die Berge hat. Das heisst aber auch, dass man jedes mal eine schmale Serpentinenstraße hoch und runterfahren muss. Wege zum Einkaufen und zum Badefluss sind etwas lang. Aber wen stört das schon im Urlaub!? Internet im Haus etwas langsam, hat aber nur unseren 15jährigen Sohn gestört. 2 km above the village of St Laurent Le Minier -- Bathing spot 2 km away -- 7 km away from Ganges and its shops -- 50 km away from Montpellier - 65 km away from the sea -- The hamlet La Combe is located on the border of the National Park of the Cevennes, on the southern slope of the mediterranean Cevennes. You will discover lots of exceptional places in the region.